Radar congratulates Top Hat Recording Studio, Knoxville, Tenn.
John Harvey and Mary Podio’s Top Hat studios was originally located in their home in Austin, Texas. Steven Durr Designs, Nashville, helped the owners rebuild in their new home in Knoxville, Tenn. The new facility, Durr says, is “a secluded, fun professional studio boasting a warm comfortable place to create music and relax with two of the nicest, most talented people in the business.” Durr spec’d custom SDD monitors to complement the 28×17-foot, 10-inch control room. 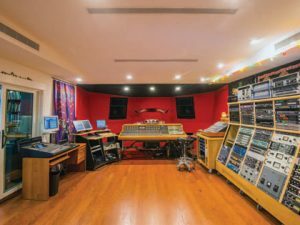 Other featured gear includes Trident 80B and Neve Melbourne consoles, as well as RADAR, Pro Tools HD, and a Studer A827 2-inch 24-track machine.